Controlled Power Technologies (CPT), a high technology specialist in CO2 reduction for the automotive industry, will demonstrate a production-ready version of its next-generation stop-start system at the LCV 2010 conference being held at Millbrook Proving Ground this week. The two-day event, which has been organised by Cenex, the UK's centre of excellence for low carbon technologies, includes a high level conference and exhibition to be attended by VIPs, government officials and industry experts. CPT will demonstrate two vehicles equipped with its SpeedStart technology - a gasoline (petrol) powered Audi A4 and a diesel Volvo. An overall 7-10 per cent reduction in CO2 emissions is claimed for the highly developed system, which is one of a number of micro-hybrid technologies the company has under development, all designed to improve the efficiency of gasoline and diesel engines. CPT is currently undertaking a tour of European car makers with its Audi demonstrator. Featuring the world’s most powerful belt-driven integrated starter generator (B-ISG) to operate at 12 volts, it has a highly responsive control strategy with far fewer stop inhibits, and the additional benefit of efficient energy regeneration during vehicle decelerations. Because of its high power and torque, it is the first system to resolve all known stop-start issues including the problem of driver ‘change of mind’. Driver ‘change of mind’ or CoM is a huge technical challenge for the industry. Anyone who has ever stalled in busy traffic will understand the time it takes to restart with a conventional starter motor – it can certainly create an anxious moment. When adapted for stop-start, a conventional starter motor can reach a point of no return when the engine revs drop below a certain speed. The engine can then no longer be prevented from shutting down before it can be restarted. If in the middle of this stop-start event the driver wants to drive on and has a ‘change of mind’ about stopping – he can’t because the conventional stop-start system will have taken over. With SpeedStart, the driver can leave the vehicle in gear and no matter how low the engine revs an instant restart is achieved by simply coming off the brake pedal; and in less time than it takes the driver to move his foot to the accelerator the engine is running again. In its production-ready form CPT’s highly efficient B-ISG, which benefits from extensive development, includes intelligent torque and current control with much enhanced ‘just forget about it and drive’ stop-start capabilities. SpeedStart can restart an engine imperceptibly and in less than half the time of a conventional starter motor. And with enough power and torque to maximise the number of stop-start events the system can significantly reduce real world fuel consumption and CO2 emissions. Its potential for energy recovery under braking is also considerable. Even under the test conditions of the New European Drive Cycle (NEDC), which includes just 12 stops, SpeedStart’s stop-start capability provides a 3-5 per cent reduction in CO2 emissions. The increased efficiency of its brushless switched reluctance (SR) motor generator, compared with a conventional alternator, provides a further 1 per cent improvement. The use of regenerative charging during vehicle decelerations, combined with an optimised battery storage system, provides a further 3-5 per cent improvement. A 7-10 per cent reduction in CO2 emissions is important. The industry has less than two years to ensure all new cars sold in Europe meet a fleet average of 130g/km and the subsequent target of 95g/km by 2020. The same 2012 deadline has been imposed in the US with its first nationwide carbon emissions target of 250g/mile (155g/km), with permission for individual states to impose tighter limits. By combining its micro-hybrid technologies CPT is already working towards 95g/km CO2 solutions. For its stop-start application, the SR machine is liquid cooled, generates peak currents of 205 amps, has a starting torque of 72Nm and a maximum continuous output of 2.7kW. Its system efficiency of approximately 90 per cent over a large area of its generating envelope is much higher than a conventional alternator. With response times of less than 1/100 second (10ms) to establish full current in the windings the SR motor ensures there are no delays, allowing an engine to restart immediately and without hesitation. Advanced stop-start technology developed as a high volume micro-hybrid solution is a very cost effective way of delivering CO2 reduction across a large vehicle range says CPT. The SpeedStart B-ISG system can integrate with many powertrains and has been demonstrated to crank 2.0-litre diesel engines and gasoline engines up to 4.4-litres. It also accommodates automatic transmissions. From an OEM perspective, this can be a very attractive cross-platform solution. There is very little modification to the base engine design or vehicle electrical architecture enabling vehicle manufacturers to apply the technology at relatively low cost. CPT is also involved in hybrid and electric vehicle developments, but in the short term sees stop-start as the most likely near term technology to enter the automotive mainstream and anticipates it becoming a standard fitment on virtually all vehicles, especially for tackling congested urban environments where the fuel and CO2 benefits can be significant. Stop-start technology currently accounts for less than 5 per cent of new car sales, but will increasingly be offered by car makers until a 90 per cent standard fit, says the CO2 reduction specialist. CPT is an up-and-coming high tech company specialised in developing cost-effective fuel and CO2 reduction measures for the global automotive industry. Its core competencies include low voltage power electronics, advanced control software and the application of 12-24 volt electrical machines to vehicle powertrains. Apart from making gasoline and diesel engines more fuel efficient, other potential applications of its technology include fuel cell electric vehicles as well as transient emission reduction and after-treatment solutions for diesel engines. Having concentrated on 12-volt micro-hybrid applications for passenger cars and light commercial vehicles, the company has just started looking at the application of its technology to 24-volt systems used in small trucks and buses. CPT SpeedStart technology includes intelligent regenerative charging as well as significantly enhanced stop-start capabilities to overcome the problem of driver ‘change-of-mind’. 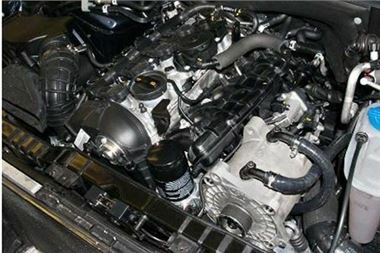 Picture shows underhood installation in CPT demonstrator based on Audi A4.